In certain applications, the current or voltage signal of a pressure transmitter must not exceed and/or drop below a critical value. This can be ensured with the aid of so-called signal limiting. 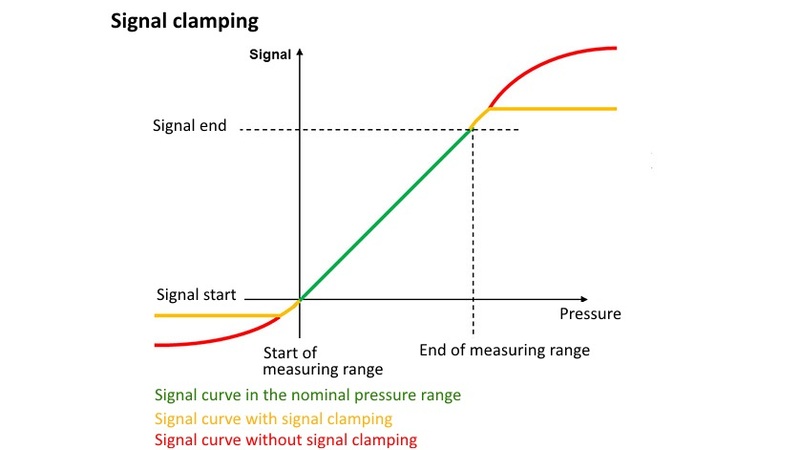 Why is a signal clamping necessary in the first place? If the pressure on a pressure transmitter lies within the nominal pressure range, then there will be a defined signal output (e.g. 4 … 20 mA or 0 … 10 V). However, in technical applications, it frequently happens that an originally planned pressure range is exceeded or is dropped below. This can happen deliberately, for example when cleaning, as well as accidentally, for example through load variations or in the event of a fault. In these cases, the sensor signal will also move outside the defined limits, so that, for example, a current signal in the range of 3.6 to 25 mA can occur. If now, however, the evaluation electronics are set so that they recognise a signal outside of the defined limits as an error, in some situations, trouble-free operation of the entire system cannot be ensured anymore. In these cases, a signal limiting of the pressure transmitter makes sense, so that the output signal is maintained within the required range (e.g. 3.8 … 21 mA). An example of a pressure transmitter with which the voltage signal and also the current signal can be limited is the model S-20 (for general industrial applications) or the model MH-3 (for mobile working machines) from WIKA.